Raiders of the Broken Planet is a third-person shooter from the studio that brought you the latest iteration of the Metroid series, Mercurysteam. Raiders looks a little like Warframe,for people that are familiar with the popular PC and console title. What Raiders of the Broken Planet does that Warframe,and their competitors, don’t is include the “Antagonist” into their horde mode-style gameplay. The Antagonist fights beside the waves of mindless creeps that flock towards the team of four working together to accomplish the various objectives that come up throughout the course of a level. It’s 4v1 gameplay within the framework of a third-person shooter. Although some are referring to Raiders of the Broken Planet as a free-to-play game, I really don’t see it that way. What you initially download from Steam is only going to consist of one prologue multiplayer mission and a brief tutorial sequence. The only way to access any content beyond that (i.e., a campaign that consists of four more missions) is to buy it. This seems like a recipe to create a fractured community, especially if concurrent player numbers continue hover at the Lawbreakers-level at which they currently sit. As a PvP-only game, forcing players to pay-in with each release of new content could make for some empty servers in the future. Some of the most frustrating issues that plague the Raiders experience are of the technical variety. On launch, owners of the Founders Pack were unable to access the Alien Myths campaign, the first of four DLC campaigns to be released over the coming months. If you spent $10 to get the Alien Myths campaign by itself, you had access to the content you paid for — but not if you spent $30 on the Founders Pack. This is an awkward start to a game that is strictly multiplayer. The maddeningly long matchmaking queue times are enough to scare away new players that weren’t sure about downloading it in the first place, but that’s not an uncommon problem at this stage in a game’s launch. Locking out the players that spent the most money on your game, the ones who showed the most faith in your new IP, albeit due to technical problems, could make it easy to lose interest in a game that shows some genuine promise. And, yes, the game shows promise. Often, the problem with these games is a lack of polish, and there is an element of that here. But it goes beyond “polish:” this title just seems like it’s missing some very basic elements. The melee system, for example, is essentially a game of rock-paper-scissors (dodge, attack, grapple), but you won’t figure that out unless you look into the guide found in the menu. This is a foundational concept to the game’s combat and overall gameplay experience, and it’s barely glossed over in the tutorial. On top of that, there is a confusing, convoluted loot system that forces players to choose between one of four different rewards at the end of every match. One prize is always going to be a blueprint for a piece of equipment, the other three rewards will be some kind of currency… or experience… or something. Honestly, I had trouble keeping track of what all those stacking numbers in my inventory screen meant, and what they could earn me; it just doesn’t seem like these systems were playtested enough. It was a struggle to figure out what I should be acquiring to buy the equipment I want. It’s hard to figure out what equipment I want in the first place, for that matter. The game launched with only five playable characters, regardless of how much money you spent on it. The weapons these characters carry are, again, very basic. At some point I started to notice that characters only have a single animation for their grapple kills, which added even further to the repetitive nature of the game. And there’s no sprint button. How is there no sprint button? I’m trying to evade the Antagonist, the one-hit-kill machine, and I have to find a way to move in a straight line for three solid seconds before my on-screen character shows any kind of urgency in their escape. This isn’t a lack of polish, it just seems like an overall lack of done-ness. It’s not very often that I complain about how easy a game is, but these are some of the most basic shooter mechanics found in games. While the cover system feels decently smooth, as the character model rather intuitively ducks behind cover and peaks around corners, the gunplay is white bread and mayonnaise. A common phrase you hear when people discuss 4v1 multiplayer games is “asymmetric gameplay.” Somehow, this game avoids that concept as much as possible. There are no dedicated Antagonist characters, abilities, or unique actions that the outnumbered player can access. You’re just playing the same game but with idiot robots on your team rather than idiot human players. Getting grappled is a one-hit-kill that puts the attacker in an invulnerable state, making for rage-inducing moments of helplessly watching your teammates get shredded, while you’re just hoping to time your own grapple so you’re not the next victim of a broken melee combat system. Your kills feel cheap, your deaths feel like you just got trapped into an animation, and the stress system they tacked on doesn’t do nearly enough to give the game any kind of nuance. Everything feels easy, so nothing feels like an accomplishment. Is there a diamond in all this rough? There are some fun experiences in Raiders of the Broken Planet — when you’re not distracted by some head scratching design decisions. With dedicated development, those fun moments might be able to show themselves more consistently. But, even after being launched for nearly a week, Raiders of the Broken Planet has not received an update on Steam. The devs have acknowledged the long matchmaking queues and the Founders Pack owners being locked out of their content, but there hasn’t been much in the way of action taken. 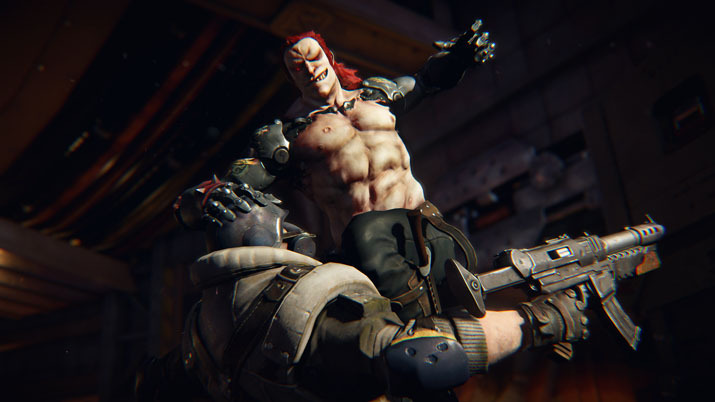 After a few patches, Raiders of the Broken Planet could turn into something fun for people that want a little PvP in their wave-based combat. The game looks gorgeous, but there’s just so little to the gameplay that everything gets stale quickly. By making no difference between Antagonist and the squad-based sides of the game, Raiders of the Broken Planet makes for a rather bland experience. Raiders of the Broken Planet just isn’t there yet. When I played an alpha build of the game, I had enough fun in those couple hours to get me excited to see what the game looked like when it launched in six months to a year. That was about a month ago. Raiders of the Broken Planet isn’t half-baked: it barely got into the oven before players were encouraged to start eating the dough. I’m still interested to see where this game is in a few months, but it’s entirely too thin and broken of an experience to get my recommendation at this time.